Unfortunately, unrealistic representations of wind and solar are alive and well in many publications. Even if mathematically correct, their ability to reflect reality should always be carefully assessed. These are like maps that show only a few major features, such as coastlines, mountains, large rivers, and major roads, leaving out the likes of non-fordable smaller rivers, marshes, ravines, and steep slopes or cliffs. Wind and solar are included in graphs comparing capacities or capital investments. Representing that capacities, electricity production, and costs per watt-hour of electricity produced can be used to directly compare non-dispatchable wind and solar with reliable, controllable generation plants. Extensive use of percentages (for growth or share of totals) for comparisons. Reliance on arguments from authority, which assume that if an “authority” says something, it must be true and can be confidently depended upon and repeated without question. Combining primary fuel sources into grouped categories, such as all “renewables,” and combining gas and oil. Oil plays a very small and diminishing role in electricity production. Such combinations can mask important realities. Use of overly dramatic or sensationalistic terms. In the January 2017 issue of Power magazine, the lead article in the Global Review (titled “IEA: Coal Boom is Over”) provides an opportunity to illustrate this. The title will be taken by the reader as the main message, and it sets the stage for the graphics displayed: “1. A generation shift” that deals with capacities, and “2. Global generation by fuel and demand.” These are the focus of this post series. Part I will address the first, and Part II the second. The underlying document, an International Energy Agency (IEA) paper (the recent World Energy Outlook) is available only at a considerable price, so this review is based only on what is available in Power magazine itself. The first chart, Figure 1 below, is re-created from the figure “A generation shift” in the magazine article. 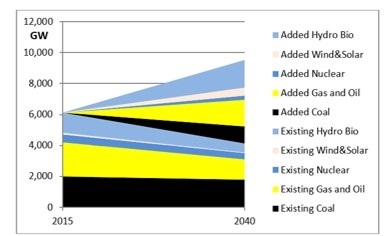 It apparently indicates that renewables (hydro, wind, solar, and biomass) show a trend toward dominating global electricity-generation capacity by 2040, and presumably beyond. 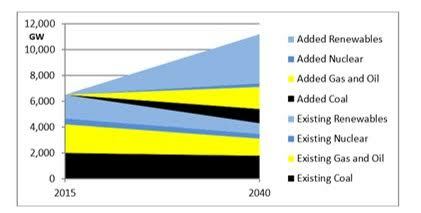 Figure 1 – Re-created capacity projections from Power magazine article. Note that all renewables (hydro, wind, solar, and biomass) have been grouped together, which conceals important aspects. Combined wind and solar are shown separately in Figure 2 for further analysis. Figure 2 – Power magazine chart with wind and solar shown separately. The reality is that non-dispatchable generation technologies (wind and solar) cannot be directly compared with dispatchable generation technologies (coal, natural gas, nuclear, biomass, and, generally speaking, hydro). This is a common mistake. The DOE/EIA cautions about this in levelized costs for generation technologies, and the same considerations apply to other generation characteristics such as capacity and electricity produced. Graphics 1 and 2 in the article suggest otherwise. 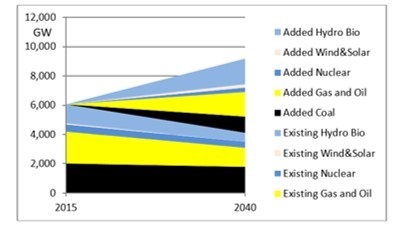 Figure 3 shows the effect of reducing wind and solar capacities to that which can be expected over time based on the natural energy flows of wind and solar. This is typically about 25% of total capacity. This production is not controllable by system operators, as is capacity use for hydro (with exceptions such as some run-of-river installations), coal, gas and nuclear plants. So, to start on the path of a proper basis of comparison, wind and solar must be discounted by about 75%. This is shown in Figure 3. Figure 3 – Reducing wind and solar capacities to 25% of maximum due to nature-dictated capacity factor. On some occasions, and on a short-term basis, wind and solar will generate a much higher percent of their installed capacities. This is often claimed as a major contribution to the grid, whereas in fact it represents a problem to grid management. In many cases, such production will likely be curtailed or dumped to another jurisdiction at a considerable discount. This is still not sufficient to make proper comparisons, because beyond the above considerations, when called upon by system operators, there may be no electricity production capability from wind and solar at that time. The relevant measure is ‘capacity credit’, which is a measure of the reliability of contributing to supply at any point in time, and is especially critical (and measured) at peak demand periods. This is important to overall electricity system reliability. More information can be seen in a European Wind Energy Association (EWEA) document. The capacity credit for non-dispatchable technologies is very low and decreases as their penetration into the electricity system increases. It starts at about the same level as the capacity factor at extremely low penetrations and exponentially falls to below 10 percent and approaches zero as penetration increases. Figure 3 shows the resulting reliable capacity values using 10 percent, which is generous. The capacity credit for the other technologies approaches 100 percent except for scheduled and unscheduled maintenance. Figure 4 – Reducing wind and solar capacities using a capacity credit of 10%. Figure 4 now allows comparisons to be made, and wind and solar play very minor roles compared to dispatchable generation technologies. The relative comparisons between technologies will be summarized below in Table 1. Note the considerable reduction in “real” capacity in 2040 from about 11,000 GW to about 9,000 GW. 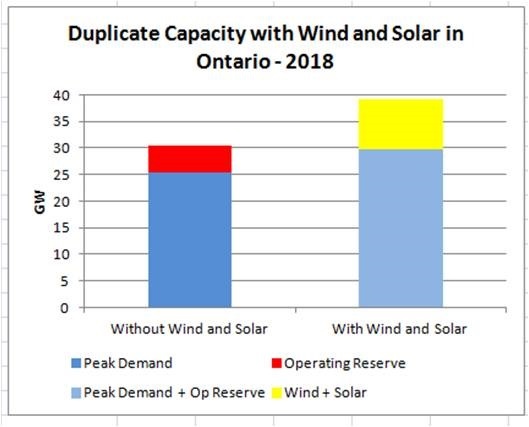 Another way to look at this is that wind and solar represent a duplication of generation capacity compared to that required to reliably meet demand as shown in the next section. 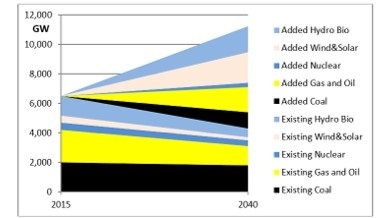 The Power magazine article does not directly show the total installed capacities by fuel type in 2040. Table 1 does this based on the above realistic determinations of the real value of the capacities. All renewables still show an increase as a percentage of the total, but coal and gas each have more capacity installed in 2040 than all renewables (adjusted for capacity credit). In terms of actual increases in absolute values, the capacity increases for these three are similar. Note that hydro and biomass (largely hydro) represent over 90% (26/28) of the renewables in 2040, and that wind and solar are 2% of the total capacity. Although coal and gas are less as a percentage of the total, the absolute levels have increased notably. Part II will look at the actual electricity produced, which is a step towards a better measure for comparisons than installed capacity, especially in illustrating the relative need for the various fuels. Wind and solar installed capacities are not a good measure of their value to electricity systems. After installed capacities are properly adjusted to represent reality, they play only a very minor role. Coal capacity still represents a significant growth over 2015, although it is slightly reduced as a percentage. This hardly warrants the dramatic terminology in the title of the Power magazine article, and the chart used in support. Duplicate capacities of fossil fuel generation plants are necessary when industrial-scale wind and solar are present in electricity systems. Nuclear is an under-used resource to provide a capability to reduce the use of fossil fuels. Oil plays an increasingly insignificant role in electricity generation and this category will often be referred to as ‘natural gas’ or simply ‘gas’. See DOE/EIA document http://www.eia.gov/outlooks/aeo/pdf/electricity_generation.pdf. Note comments in the second paragraph on pages 2 and 4, and that wind and solar are shown separately in the following tables. Other generation technologies are taken to be 100% as the full capacity is available as required by the electricity system operator, except for scheduled and unscheduled maintenance. It is acknowledged that wind and solar Capacity Factors may improve for new builds over time. Solar is the most likely to experience technology improvements. Wind is a very old mechanical conversion process that can be improved slightly with larger and taller wind turbines. Countering any improvements, indications are that wind turbines will degrade notably within the realistic 15-20 year lifetime as explained here. See https://www.scribd.com/document/283089522/Large-Scale-Integration-of-Wind-Energy-in-the-European-Power-Sypply-A-EWEA-Report, on pages 122–24. This should be read carefully. To transfer the x-axis in Figure 34 to another jurisdiction, it must be converted to wind penetration percentage. 2006_grid/Martin_Hoppe.pdf, slides 12 and 13. The organization producing this presentation, which was given at an EWEA conference, is deENet (deenet.org) More information on deENet can be seen at https://www.research-in-germany.org/shaping-the-future/campaigns-to-date/india-and-germany/Official-Participants-and-Impressions/deENet.html. The Long Term Energy Plan (LTEP) is produced by the Ontario Power Authority, which has just recently been merged with the system operator (IESO). The LTEP is not as easily accessible there, except for a brochure-like summary. The information shown is from the LTEP Cost of Electricity Service 2013 LTEP: Module 4, which I had previously saved. The media reports on installed capacity of wind and solar is one of the most significant fake-news items related to climate change. Everyone who’s mentally fit (even ill-educated reporters) knows the sun doesn’t shine all the time, and the wind doesn’t blow continuously; however, most people never question articles that state some new solor or wind installation will be capable of supplying power to 10,000 homes. Sure, it may be true for a short time on a clear day in summer for solar, and for short, mostly unpredictable, periods with wind, but few, if any, electrical power customers would be satisfied having power 25% of the time. It appears to me that you are writing from the perspective of fulfilling current or perceived future energy needs (largely within the industrial societies). You are, of course, not at all alone in viewing and critiquing sources of energy from this perspective. My own view is that this, while well intended, is not useful in addressing increasing evidence and harm caused by climate change/climate chaos. I have come to the conclusion, with the help of many thinkers/writers/researchers, that responding to climate change/climate chaos solely from the perspective of either (1) how do we reduce our output of CO2 (to say nothing of hexaflourathene (C2F6), nitrogen triflouride (NF3), and sulfur hexafluoride (SF6) or (2) what can we substitute for oil, gas, coal, nuclear so that we continue to grow? Either (or both) provide a flawed ‘single story’ approach when what is required is a much broader inquiry into what has allowed the current circumstances (drought, floods, acidification of the ocean, pollution of rivers and lakes, etc) to evolve? When one takes this broader approach it becomes necessary to examine: forms of governance, methods of decision making, accumulation of political power and abuse, cultural norms and myths, etc. This, to me, is where the hard work must be done, where significant change will need to occur over time, change that will most likely be effective an sustainable if determined at the local level, but not in isolation. the outcomes have the potential to bring about much needed changes if guided by two principles: The Precautionary Principle, and the Principle of Do No Harm. While it is understandable to wish for a technological fix, I would contend that our reliance on technology as a panacea absent important moral guidelines or imperatives has brought us to this moment. Given the excellence of your research, and the clarity of your analysis, it is my hope that you may consider expanding a desired outcome from continuing in our present trajectory of growth, consumption of finite resources to one of true conservation and, even, de-growth. Thank you for your very thoughtful comment. I believe I have already, to some degree, dealt with the issues you raise. I will take a bit more time to respond more fully, as your comment deserves, with links to my other treatment of these topics. You appear to believe in climate change but are not satisfied that the response should be limited to (1) just reducing emissions, and/or (2) finding energy sources to replace oil, gas, coal and nuclear. I believe you are looking for a broader approach, including societal approaches. By ‘climate change’ I presume you mean problematic anthropogenic global warming, and I will continue to use your shorter term. I also got the impression that it appears to you that my post is from the perspective of just meeting current or perceived future energy needs. My intent is to present reality, not to advocate for any particular point of view. So, this post was not about assessing current or perceived future energy needs. It was an attempt to illustrate how ‘authorities’ can be wrong and to help as many as possible to understand this. Although it is an IEA report (an OECD institution) that is driving this discussion, it is reporting on global matters. I suggest that energy needs over the next 20-25 years will be significantly impacted by today’s developing and undeveloped countries. If you are looking for new primary energy sources, then the options for the foreseeable future are limited to what we now have. Basically, we have to make the most of these to properly meet the energy needs of all people on the planet. I cannot over-emphasize the importance of this. With respect to climate change, in my view, the considerations are extremely voluminous, not properly consolidated and not sufficiently convincing, even taking your cited evidence into account. In short, as an individual, I find the whole matter, disappointingly frustrating and very unsatisfactory. My response to this, for the majority of us caught in the middle, is contained in this post. This post also outlines the measures that would have to be taken to achieve the emissions reductions deemed necessary. These I suggest are totally undesirable and unnecessary. Also have a look at the areas proposed where we could be better spending the money (hundreds of billions annually) than on climate change mitigation. The latter might begin to address your ideas for improvement in the process. Even if I have misunderstood your intent in some ways, my response would likely serve equally well after any clarifications. Please cite the evidence which does more harm than denying people adequate, reliable and affordable energy – for running ambulances , hospital operating theatres, transportation , heating , cooking etc. I’ll look forward to Part II. Perhaps the most egregious tub thumper for “renewables” is Fox News, where virtually every article on the subject commits all of the statistical/methodological frauds mentioned here to make the audience believe the pigs of wind and solar can fly. Not sure why Kent fondles the idea of capacity credit for wind, since it has no operational value whatsoever. Beyond this, giving wind a capacity credit of 10% is more than generous: it’s more than three times the actual (statistical) capacity credit shown to be the case based upon the amount of rated capacity necessary to make a dent in any supply portfolio. Modernity will continue to rely upon increasingly sophisticated interlocking technologies, which use will influence and alter values just as it has for thousands of years, increasing life spans while giving billions of people more choices for improving quality of life. The anti-intellectualism that comforts those who support “renewables” as a means of enhancing modernity is palpable. Engineers and economists who endorse wind and solar are contemptible enablers of delusion. Solar arrays and wind turbines belong in the same museums that showcase gliders and sailing craft. These museums don’t even have to mention why they’ve become commercially obsolete. For anyone with any critical thinking skills knows why…. Thanks for your comments, which are always informative. I know I was generous (and said so) on the capacity credit matter. There are three reasons: first, I did not want to get into an argument that claimed something higher than what you suggest and detract from my main point that wind and solar have little capacity value – far below what the IEA shows; second, I was using information acknowledged by the European Wind Energy Association (no less); and third, it is jurisdiction/wind penetration dependent. Further in support of your position, capacity credit is dependent upon the level of electricity system reliability assumed. Your value is realistic, assuming very high wind and solar penetration and/or system reliability expectations of 99% plus. I had understood your reasoning for assuming a 10% capacity credit for wind, Kent. But I still don’t agree with it. First, European claims of higher capacity credits are based upon small amounts of wind. You’ll recall it was EOn.Netz more than a decade ago that showed that larger amounts of wind, amounts that are competitive with the output of conventional generators, would put its capacity credit at less than 3%. This is very old news. But–so what? Capacity credit is a statistic derived as the amount of output measured at key peak demand times over a given duration (usually a year) from electricity generators vis a vis the rated capacity of those generators. This metric is used overwhelmingly for supply planning purposes, not for realtime operating functions. This capacity credit average has no more predictive power about what the output of a wind machine will be at any future time interval than a baseball player’s batting does as a predictor of what the batter will do in his next at bat. What rankles me about what you’ve done with capacity credit for wind is how you seem to have conflated the idea of capacity credit with the idea of firm capacity. You’re not the only one to do this. It’s become a favorite PR ploy for grids like the PJM and for AWEA, and is used to placate politicians and electricity regulators by making people think wind has some kind of firm capacity–just like conventional generators–even if it is minute. Nonsense. Such a statistical metric has no value in a practical operational sense. Here, the only value is firm capacity combined with high unit availability–generating units that are available to produce electricity when called upon, given the usual contingencies of start up and ramping time. They must not only be capable of running and producing, but they must also have fuel on board to do so. As Tom Tanton once pointed out, when it comes to immediate expectations of putting up supply to meet demand with precision, “grid operators are binary: something is either available (1) or it isn’t (0).” For wind, it’s always 0. For the sake of making an argument that no one in charge cares anything about, you seem willing to cede, falsely, that wind has functional modern power capacity. AND IT DOES NOT. And it never will. Perhaps Part II will clarify this. ISO-NE monitors the output of a wind turbine system every 5 minutes, and as long as it stays within certain parameters, it is considered to be within dispatch. If not, a do not exceed order is issued. This helps wind system owners increase their production, which otherwise might be curtailed. Regarding capacity credit, is that understood to be for long term capacity planning/sufficiency purposes? Yes, capacity credit is important for capacity planning, and takes into account the very critical matter of overall system reliability considerations. This does not mean that it has no relevance in real time. It is extremely relevant there. The planning ensures that the system reliability is at the level required at all times, especially peak load conditions. Here is the URL regarding wind being “fully” dispatachable. It would require constant monitoring of the wind resource energy 5 minutes, evaluate the potential of the resource to produce wind energy, and then monitoring that energy output on a 5-minute basis. A wind turbine owner could bid a percent of that variable output in the short term capacity market, and get paid for it. That is a lot of baby sitting, but apparently it is working in New England. Here is a later URL on the subject. 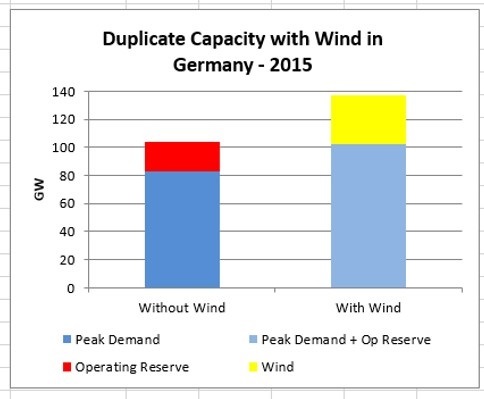 One mistake here is to assume that it is wind production alone that is the problem. It is not. As shown in the references I provided the combined effect of short term variations in both wind and load. This net effect exceeds that of each alone. Read about the combined effect of two “random” variables. This is what must be balanced by the rest of the electricity system to provide useful, reliable electricity. The results are very dramatic. I highly recommend you read, understand and apply the information in the references I provided. There is an interesting statement (among others) in the first reference you provided, “… and final, requirement for making renewable energy fully dispatchable”. Fully? This comment alone should sound warning bells. Saying that this solution has “solved the problem” reminds me of a similar case when “mission accomplished” was announced. It is easy to say. I would not necessarily rely on such a statement even by an ISO, because in part it begs the question of “what problem?”. For example, the problem might be primarily keeping wind plant operators happy. There are other possibilities. I suggest you do not so readily accept and repeat such claims without much more investigation. I had put “fully” in quotation marks. The referenced article was written by the Vermont Law Foundation. The article merely describes what ISO-NE does to make wind turbine owners happy, i.e., minimize their curtailments. I am sure ISO-NE monitors its system conditions and how the wind energy and other energy additions, and the load deductions are affecting the overall system, and the Do Not Exceed notices to wind turbine owners are issued based on that. Fully dispatachable would mean, a generator would receive a call from ISO-NE to be on line at time A with a steady B MW, which is the standard definition of dispatchable, not some lawyers’s construct. Thank you for this article which casts light on the statistical illusions of renewable power, even if some of the assumptions are overly generous to renewables as pointed out by commenters. One could envision a book on the topic possibly evolving into a standard for journalists, academics and policy analysts for an “apples to apples” comparison of renewable, nondispatchable power vis a vis conventional, dispatchable power. But those in the Knowledge Class would ridicule it and ignore it. Nonetheless, perhaps someone or some team should undertake such an effort. That renewable power is nothing but redundant power is as self obvious as the sun rising and setting. But the self obvious has been lost in a hall of solar mirrors and a wind tunnel of misinformation. I went from a big supporter of solar/wind in my youth to a serious critic. Thankfully I was alwasy realistic about it. My overriding concern was always that a successful technology could never require sacrifice, still…looking back I know I too had fallen victim to a PR machine pushing solar (although in those days it was mostly just niche enthusiasts with good intentions, nothing like today). (2) Then things get worse rapidly. Because they are not dispatchable, the wild fluctuations of wind, coupled with the laws of supply and demand cause behavior that should force all sane business men away from renweables. Once again, all capability for profitability is eliminated when shotfalls lead to higher energy prices during down time and prices crashing when production is high. And legislation giving priority to renewabls only makes the problem worse, sometimes forcing negative spot prices on electricity. Clearly one cannot make a profit PAYING for someone to take energy when you finally have a perfect day. (3) It is essentially an impossible dream, not from a standpoint of profitability (which as you’ve seen fails almost completely in two places). The sole reason for any consideration of such insane schemes is to avoid climate change. Unfortunately, renewables have another deal breaker hidden up their sleeves. They take 5X-10X the materials, labor, and maintenance for capacity that lasts 1/3 to 1/2 as long (as compared to nuclear). As soon as I realized this issue, I knew that even if climate change was a big problem (its clearly not) it wouldn’t matter because the “solution” of renewables does not address the problem. It could not be rolled out fast enough. The world is struggling with its trivial percentages of wind/solar for electrical production (which doesn’t significantly change real-world output of the grid) but world energy consumption is THREE TIMES electrical production. The world could put 10X the effort into deployment and still be unable to complete the task fast enough. Oh, and let’s not forget that green jobs of this type are in fact, anti-jobs. They are a return to a time when it took far more labor to produce the same amount of a fundamental product for our civilization. Every extra “green job” in the energy sector (relative to current jobs) is a person that could have produced something else for the same cost…food, electronics, medicines, services, etc. Indubitably. But the situation is even more cringeworthy than you suggest. All God’s chillin’ love renewables, including Republicans, Democrats, The Sierra Club (et al), The World Bank, Goldman Sachs, virtually all media outlets, Big Oil, Big Gas, Nuclear, King Coal, the Pope, the grid systems and their regulators, virtually all public service commissions, the US military, most of the leaders of the nations of Europe, Asia, and of course, the continent of Australia, etc, etc, etc. Renewables “integration” within the energy sector is akin, politically, to the mainstreaming involved with ADA–in the most contemptable fashion possible as it fraudulently makes people believe that energy sources with extreme disabilities can be converted into modern power. And not to believe this is desirable, or even possible, is essentially commiting a hate crime. Roll up your windows and hold your nose….